There’s a new dance in town. 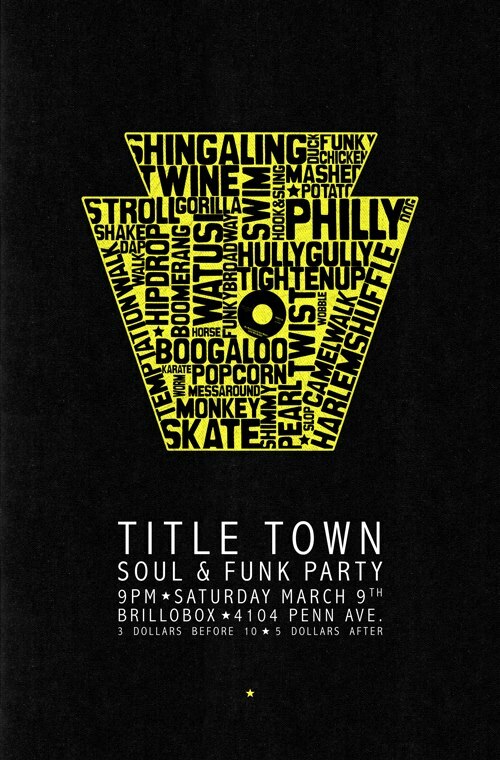 TITLE TOWN Soul & Funk Party SATURDAY, March 9th Brillobox (4104 Penn Avenue, Pittsburgh) 9pm - 2am $3 from 9pm - 10pm; $5 10pm - 2am Get up, get into it. TITLE TOWN is back and rarin' to do it again. We’re takin’ you on a trip and we've got the goods to get you on the floor. Soul records every second Saturday of the month at the Brillobox: That’s what we do. It's a unfiltered, live-wire mix of 45 RPM vinyl, the TITLE TOWN sound -- equal parts '60s and Northern Soul, deep funk grooves and old-school R&B -- highlighted by Latin grooves, modern soul, late-night boogie and everything in between. It's a trip of another sort, served up best when it's sweaty, funky and above all, original. Early arrival is recommended, so get in before 10pm to take advantage of the $3 early-bird special. It all goes down at the Brillobox, Pittsburgh’s favorite neighborhood club, offering a full food menu, stiff drinks and a commitment to providing the community with high quality music and art events. RSVP here for updates and prizes.